A new digital exhibition illuminates the making of ‘The March,’ a landmark documentary of the period, and the film’s creator, UO grad James Blue. 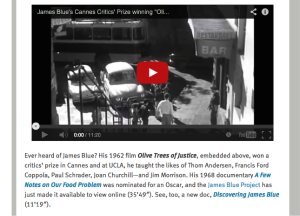 With support from the Andrew W. Mellon Foundation, the film is now the centerpiece of a major new digital project by UO faculty members, staff and students that digs deeper into Blue’s legacy to engage a new generation with the filmmaker’s work. Blue died in 1980 at age 49. Read the Around the O article here. 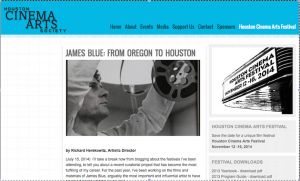 The Houston Cinema Arts Society posted a blog entry by Richard Herskowitz on the connection between Houston and Oregon, and curatorial activities of the James Blue Project. Fandor’s Keyframe Daily reports on the James Blue Project’s activities, including our posting of the complete A Few Notes on Our Food Problem in the website’s “Films” section, with supplementary materials.